I met Shannon at Alt Design Summit in January. Although she lives in Texas and I live in Vancouver, although she does the social media gig for paid work and I this blogging thingy for fun, and although there were about 500 attendees, we kept running into each other. Shannon is all sass and high energy with that amazing Texas Charm. There is something lovely about Southerners (I do know enough to understand that Texas might just be an honorary member of the South!). Come take a peek with me to see where she creates for Compartment Life. For Compartment Life I create mainly in my cubicle at my office in Texas. It's not always the most inspiring area with beige wall and 80’s fabric so I constantly print out images (mostly from pinterest) to post in my cubicle so I have something to encourage me to talk about beautiful things. I get to do a lot of DIY in the photography studio of our office; most of the time it’s the most quiet and peaceful place in our building with all the hustle and bustle that goes on in our office! What time of day do you do your work and why? I do most of my blog writing towards the end of the week. It really depends on my work load for what time of day I start writing. I may start a post and not finish it for 2 weeks because I've been inspired in a different area. What's your go-to snack when you are feeling peckish? My go to snack is hummus and pita chips and carrots. I'm a sucker for red pepper hummus. If I'm out of it for the week you may not way to come near me! When you are procrastinating, what do you do? Procrastination is a constant for me, so I try to at least make my procrastination tactics relevant to my blog by reading other blogs to inspire me or making lists of things I need to get done. Corporate office or home office, coffee place or at the kitchen table - the constant is the need to create. And we all figure it out no matter what our circumstance. 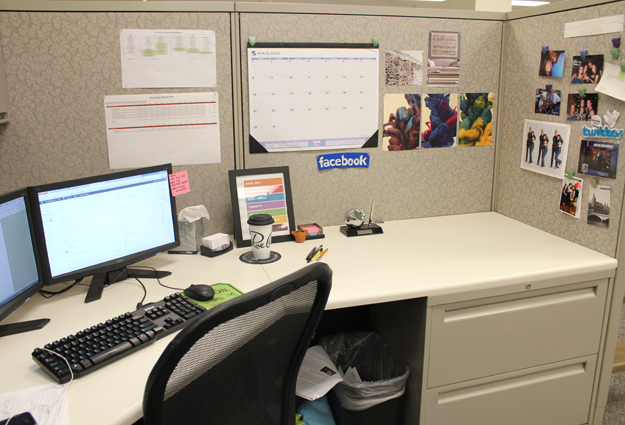 Have you had a creative job in a cubicle? How did you adapt to make your best work?